Today we finish out the series “God and Your Bod”. We’ve discussed the eyes, ears, mouth, feet and conclude with the hands. How to glorify God with our hands. I’m writing this after the musical portion of the first of our three services. The last song we sang was “Amazing Grace (My Chains are Gone)” made popular by Chris Tomlin. Louie Giglio the founder of the Passion movement spoke about how this song came about. Chris had been asked to remake “Amazing Grace” for the movie of the same name about William Wilberforce’s struggle to end slavery in England. I have to be honest, as a Creative Pastor, it is a great thing to plan services and create environments condusive for people to meet God, but what is greater than that is seeing it happen right before your eyes. Greater still is to be able to experience it alongside the people whose stories you are familiar with, and know that their chains are gone and they have been set free. No greater joy is there than when you have done all that you can do and then see God take it a quantum step further. 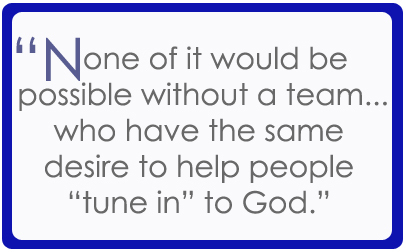 None of it would be possible without a team of people – musicians, singers, tech people – who have the same desire of creating environments that help people “tune in” to God. Today we talk about using our hands to glorify God. I’m grateful for those who use their “hands” each Sunday to glorify God. Thanks to: Gerry Marshall, Kevin Kinkade, Joe Booker, Kim Hague, Chris McCray, Gary Lane, Amy Hildreth (who gives me more support and love than I think I’m worth), John Sloan, Eli Hoffman, Jed Broussard, Lauren Evans, Casey Leeb, Lauren Gill, Bianca Broussard, Laura Kinkade and all of the other volunteers who make Sundays run so smoothly. What are we here for? We are here to use what we have for the greater good, in the moment, to glorify God by actively pursuing God’s “kingdom here on earth as it is in Heaven”. This entry was posted on June 8, 2008 at 8:51 am and is filed under Context, Creativity, Influence, Lifepoint, Me, Message Series. You can subscribe via RSS 2.0 feed to this post's comments. You can comment below, or link to this permanent URL from your own site.